Have you ever been in a perpetual state of flux, or felt that you are constantly running behind instead of being ahead? Well, let me tell you that you are not alone. Ironically, in trying to adapt to the rapidly evolving changes in our lives we often neglect the very thing that could make a difference, i.e. our own energy. While it may ring true at an individual level, this dichotomy exists at an organizational level too. After conducting a survey with 19,000 people, Tony Schwartz and Christine Porath surmised in their HBR article that “people feel better, and perform better and more sustainably when four basic needs are met – renewal (physical); value (emotional); focus (mental); and purpose (spiritual)”. However, even though there is a strong link between thriving employees and workplaces that focus on health and well-being, only 14% of the organisations have this as a company priority. Further, there’s an internal paradox that people face every day – how to get more and more done with less and less resources. To me both these elements constitute a double whammy, and can potentially lead to lack of focus on performance, followed by exhaustion and disengagement. The obvious temptation for organizations is to invest in wellness programs – a band-aid of sorts, but is that enough to achieve the elusive cultural shift? In my view a better strategy would be to attempt a more fundamental transformation that goes to the heart of the matter. We at Schneider Electric are trying to do just that, but like any cultural change it cannot be completed overnight. 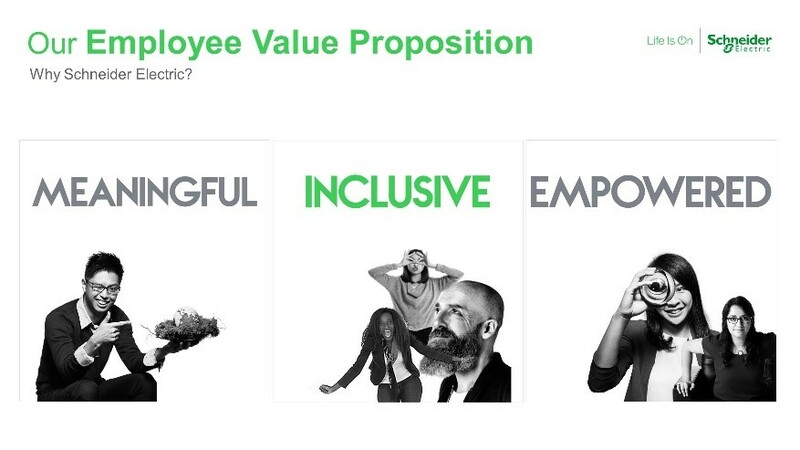 The fundamental aspect of the transformation at Schneider Electric begins with a promise within our employee value proposition (EVP) that people are empowered to manage their unique life and work. So, why is this important and how does it work in practice? While conceiving the strategy we realized that shifting individual and collective behaviors is a long journey, and so basics needed to be tackled first. Awareness and training on well-being were identified as vital enablers. 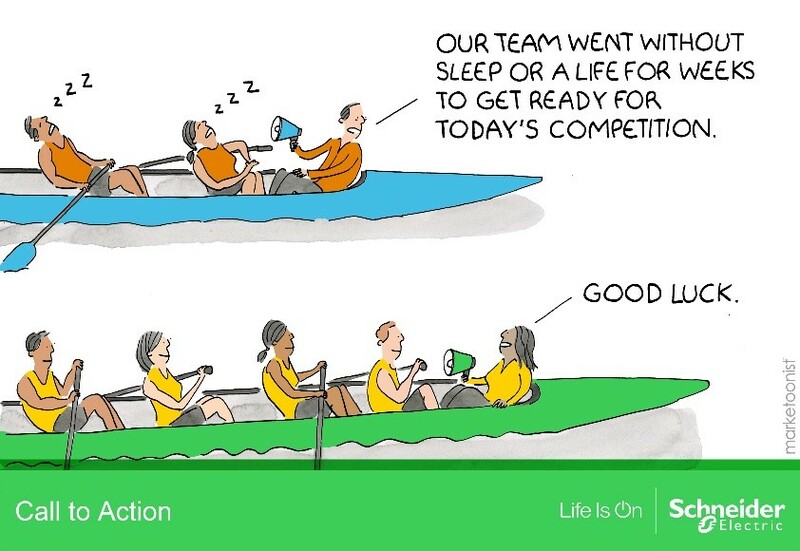 To begin, top 2,000 leaders at Schneider Electric demonstrated their commitment by participating in well-being training sessions. This proved to be quite a catalyst as it created the much-needed momentum. At last count over 38,000 people have participated in awareness and training sessions. As the name suggests, labs are essentially team experiments around new behaviors that change the way we work through actions that are meant to scale-up. We are convinced that small actions every day can lead to significant cultural change. Right from the get-go Labs were billed as a collective adventure – co-design to co-implementation. To make this real, a first-of-its-kind global crowdsourcing campaign was launched to collect ideas that had the potential to make a difference in people’s lives. There are now 1,000+ labs in motion, with activities such as “happy stretching”; “weekly yoga”; “mindful meetings”; “10,000 steps daily”; “power nap”; “eliminate time waste”; “charity events”; “5 languages for appreciation”, and many others. Our workplaces are being re-imagined through a global and consistent set of design principles. Every aspect of the workplace, including location, accessibility, architecture, layout, design, and furniture is being re-configured through the most judicious use of available resources. Not only will the facilities feature the latest and faultless safety and security, the focus is on boosting well-being, innovation, inclusiveness and performance. As they start coming to life it is not difficult to understand why workplaces are so vital in inspiring people and enabling the transformations we seek. “Flexibility is getting personal”; and “51% of all employees want more flexible work options” . So, instead of just providing people options to choose their working hours, we focused on a culture of smart working around workplace flexibility; working time flexibility; and a flexible/ inclusive working environment. “Your cognitive capacity is significantly reduced when your smartphone is within reach — even if it’s off” . While alarming, it’s a sign of our times, and poses a particularly challenging contradiction – the desire to stay connected in this digital world, while trying to safeguard our well-being. At Schneider Electric, new ways of working have been designed around this reality, including productive meetings and effective use of email and technology. Going beyond the rituals the message is that people are free to make choices, and voice concern when work requirements do not let them be at their best. For instance, I encourage people to skip virtual meetings at odd hours instead of having a global rule, which is not realistically possible given operations across multiple time-zones. The behaviour of leaders has the maximum impact in creating an environment where people feel safe and empowered to do their job. The good news is that high performance does not need physical and mental sacrifices – in fact, it’s quite the opposite, and leaders must embrace this fact. For instance, when the #FreeUpYourEnergy initiative was launched at Schneider Electric, all we asked of leaders is to empower and trust their people to get the job done, and resist the temptation to micro-manage. Overall, the heartening feedback from employees coupled with external recognition of our efforts indicates that we are headed in the right direction, but a lot more needs to be done. On a personal note, over the years my own well-being has been a combination of the organization giving me the flexibility to do my job; the choices I’ve made to control my agenda; taking the time to recover when needed; and doing what I find personally fulfilling. If I hadn’t paid attention, it would have been nearly impossible to cope with the demands of my job, which involves constantly learning; building the future of our company; and of course, designing / executing strategies along with my team to ultimately win in the market through passion, commitment and fun. Finally, I don’t expect the demands created by the environment to come down anytime soon, so at work or in life, let’s change the rules of the game, work smarter and actively do what we can to make the most of our energy. Employees perform the best when they are trusted and empowered, it also leave rooms for employees to challenge status quo, do things differently and innovate, which are crucial to the success in today’s business environment.